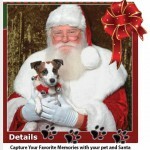 The minutes are ticking away on your last opportunity to get a photo of your dog with Santa. Make a memory or get ready for next year’s holiday card. But get going now. The Americana at Brand will hold its last Pet Night on Wednesday, Dec. 18. Go online to purchase your photo package; prices range from $20 (the Comet Package) to $60 (the Rudolph Package) depending on the numbers and sizes of photos and whether you have the photos stored on a DVD and flash drive. The photos are taken at Santa’s Cottage. 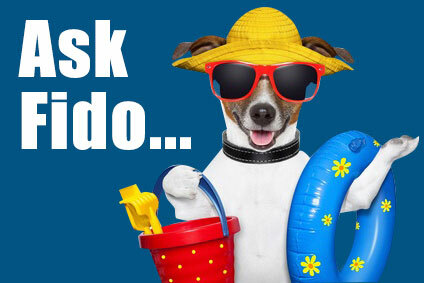 If your schedule was simply too packed to get Fido to a photo op this Christmas, plan ahead for next year. Between Thanksgiving and mid-December similar photo sessions were available at the Westside Pavilion; and Santa Monica Place, which also offered pet adoptions. The hours when pets can have their photos taken with Santa are limited. Get Your Dog's Photo on the Cover of "Traveling with Your Pet; the AAA Petbook"
Do you have ideas for dog Halloween costumes?